By 2020, to meet average tailpipe emission standards, around 10% of all vehicles on the road will be electric. The other 90% won’t be. So, rather than disappear down the track of devoting all its resources to developing cars that will only account for 10% of the market, Mazda is concentrating on making its entire range more efficient. It calls this programme ‘Skyactiv’, and it covers the whole car: engine, transmission, body and suspension. With a modern internal combustion engine, still only 30% of energy reaches the wheels. Mazda has increased the compression ratios of its Skyactiv petrol engines to 14:1, and also reduced the compression ration of its diesel engines to the same 14:1. With a lower compression ratio, the forces and stresses inside a diesel engine are less, so the engine can be built lighter, reducing frictional losses as well as overall weight. Changing compression ratios also negates losses. Mazda Skyactiv petrol engines offer 15% better torque and 15% better economy, the same as a good, present day diesel engine. Mazda Skyactiv diesel engines offer 20% better economy than today’s diesels, while complying with EU6 emission legislation without the need for add blue or urea solutions. The manual is designed to be ‘short throw’ and feel like an MX-5. It is 16% lighter. The automatic feels like a manual with faster gearchanges and a 4% - 7% improvement in economy. 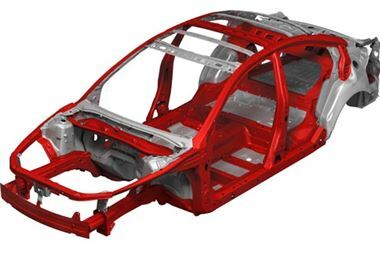 The average weight reduction of Skyactiv bodies will be 100kg (more than the weight of the average man), though the use of 60% rather than 40% high tensile steel in the body construction. An 8% reduction in component weight ahs been achieved, improving both mid to low speed agility and high-speed stability, a notoriously difficult combination. The first Skyactiv Mazda will be the CX-5 SUV to be launched in Spring 2012, already seen as the Minagi concept car. It will have a 2.2 litre chain cam diesel engine developing 180PS, emitting less than 120g/km CO2 and offering 60 – 70mpg on the EC combined test cycle.